Since blogging about the Meerkat livestreaming app a couple of weeks ago, I’ve gone a little bonkers. I said at the time, “I could easily see myself falling head over heels in love with Meerkat,” and I did. I talked incessantly about it. I livestreamed random moments — hanging out in the park, a morning visit to the beach, a church meeting — and used it as a video backchannel to our HPR radio show. And I’m not alone in this obsession. Its launch was perfectly timed to steal the show at SXSW in Austin, and despite being kneecapped by Twitter, its coming out last week was considered the best SXSW breakout hit since Twitter itself. Even though Twitter is planning to launch a competitor called Periscope, Meerkat has a heck of a head start. I say all of this to explain this morning’s “Geek Beat” segment on Hawaii News Now. My partner in geekiness Burt Lum and I both dedicated the precious few minutes of live television we had to Meerkat. We talked about the app, its applications, and its looming competition. But we did more than talk on air. We were both also streaming video of everything happening behind the scenes, beginning several minutes before the “Geek Beat” segment. 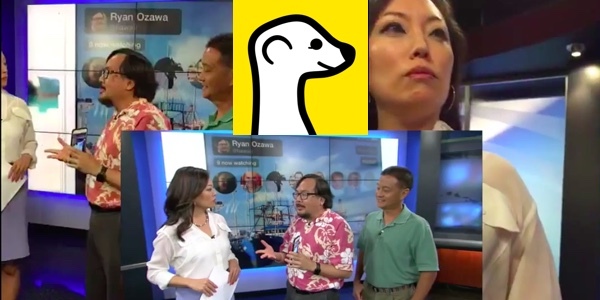 By the time Sunrise anchor Grace Lee started talking to us, we had added a couple dozen Meerkat viewers (many outside Hawaii) to the Hawaii News Now audience, and had three live video feeds coming out of the studio. As fun as it was, I couldn’t resist putting everything together in a single video. For once the vertical orientation of Meerkat videos was a good thing, since I was able to easily fit both side by side. I then plopped the official clip that was broadcast right on top of them. It took a little too long to sync everything up (the differences between my iPhone and Burt’s meant a slight difference in speed, requiring me to clip a few frames out of every minute or so to keep things lined up). But the results speak for itself. Thanks to Burt Lum for sharing his Meerkat video to make this collage.